Earlier today, a couple of leaked press renders showed that Amazon is working on a 10-inch Kindle Fire with a modified design language. Interestingly, the renders showed that the new Kindle Fire might run a redesigned version of Fire OS, Amazon's forked Android version. At the time, the hardware specs of the tablet were pretty much unknown. Coincidentally, just hours later, a new 10-inch Kindle Fire was discovered in the GFX Bench database, complete with most of the specifications. If these specs turn out to be accurate, Amazon's upcoming 10-inch slab will be a mid-range offering. 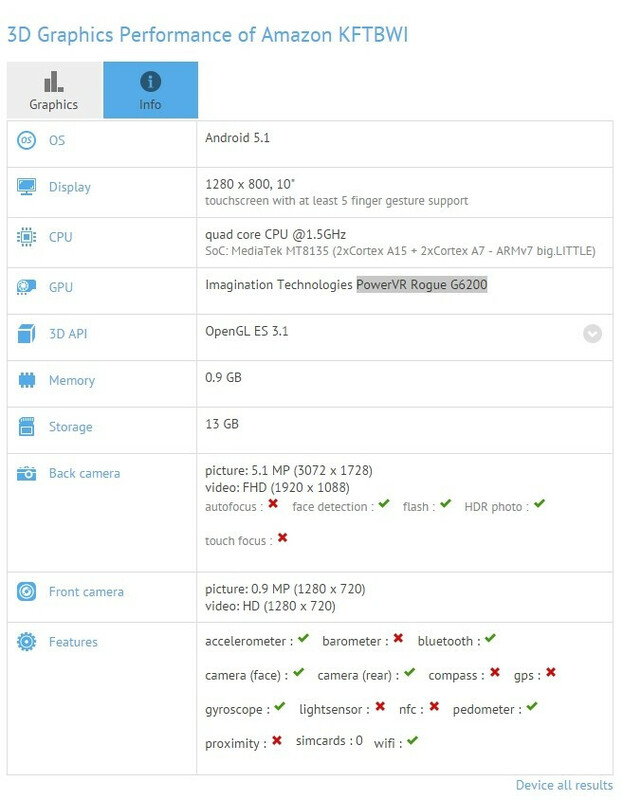 The benchmark lists specs such as a 10-inch display with a resolution of 1280 by 800 pixels, and a MediaTek MT8135 chipset - two ARM Cortex-A15 CPU cores and two Cortex-A7 cores, PowerVR Rogue G6200 GPU - paired with 1GB of RAM. The resolution of the display and the low amount of RAM are two of the tablet's major disadvantages. The earlier leak showed a tablet with sharper corners and lines than Amazon's current-gen Kindle Fires, as well as an updated version of Fire OS that looks more like the stock Android UI. The benchmark result says that the new Fire OS will be based on Android 5.1 Lollipop, but Amazon's customized take on Android will probably remain incompatible with Google services. What do you guys think of these specs? Are you interested in what will probably be a cheap 10-inch Kindle Fire tablet from Amazon? I rather pay more and get something worth more. I'm not sure the $50 rumor was for the 10 incher, there's reports they have a 6 inch with low specs in the works too, that is possibly 50. But yea anywhere between 50-100 would make this a pretty decent deal. $ 50 rumor is for another 6.7 inch tablet. It was also found on GFXbench with all tech specs. I don't think this one is rumored to be $50. I believe that's the price for the 6 inch one. @post 1 and @post 2. Pretty sure moms and grandmoms who don't know tech will be receiving these for Christmas and they may never even sign into them as they sit on a table somewhere a few years to prove their kids gave them something for the future.